Seven gruesome killings took place in Shadwell in 1811. The Ratcliffe Highway murders, as they became known, included the deaths of women and children, all beaten to death in their own homes. These horrors were the most notorious crimes of 19th Century London until a certain Jack came along. On the 200th anniversary of the murders, Lloyd Shepherd uses his debut novel to pick apart the investigation, while building up a fictitious back-story that spans centuries and continents. The backbone of the book is set in Wapping and Shadwell during the murders. It is a place in flux, with the goods of Britain's burgeoning empire pouring in to London's fast-expanding docks. The Thames River Police, an elementary constabulary, is in place to oversea the tide of ne'erdowells who go with the territory, and we follow magistrate John Harriott and his senior officer Charles Horton as they seek the murderer among an almost limitless supply of potential suspects. But something very special is interleaved between the Wapping chapters: a second strand that begins in Plymouth in 1564 and works its inexorable way to the scene of the murders 250 years later. To say much more about that narrative would introduce spoilers, but along the way we meet familiar characters such as Francis Drake, Captain Morgan and Hans Sloane while contemplating the slave trade, the roots of British empire and the limits of the Enlightenment. Shepherd guides the reader through this complex soup of dates, places and tenses with masterful storytelling. What could be a dizzying and annoying back-and-forth between eras works a treat. The two story lines are equally addictive and ultimately plait together with such improbable ease that you feel Shepherd could, if he chose, build a convincing case against Dale Winton for slaying the Princes in the Tower. 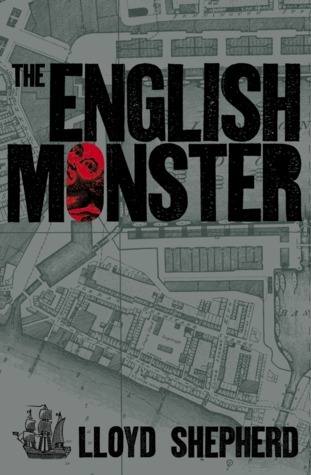 If you like your historical fiction with a mighty twist, want to know more about London in the early 19th Century, or simply enjoy pacey but thoughtful fiction, the English Monster is up there with the best. 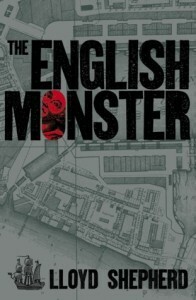 The English Monster by Lloyd Shepherd is out now form Simon & Schuster. Buy it now as ebook or hardback. Lloyd Shepherd takes us on a tour of modern-day Wapping, pointing out some of the locations from the novel. Our guide to the Ratcliffe Highway murder sites.